Corals shelter many kinds of invertebrates, such as this Christmas-Tree Worm. This worm builds a tube on the surface of the coral, and as the coral grows it buries the tube in the skeleton of the coral. Then the worm is protected with only its head showing. If danger threatens, the worm can pull its head down into its tube in the blink of an eye. This picture shows this worm's tube. The tube extends down across the surface of this Giant Star Coral. You can see the "antennae" on the top of this worm's head. These two "antennae," called radioles, work like a net to catch tiny plankton that float by in the ocean currents. The radioles also work like gills, allowing the worm to breathe. This picture shows about 2 inches of the surface of the Giant Star Coral. Each bump on the surface of the coral is one animal, called a polyp. Each Star Coral polyp was nearly 1/4 of an inch wide. 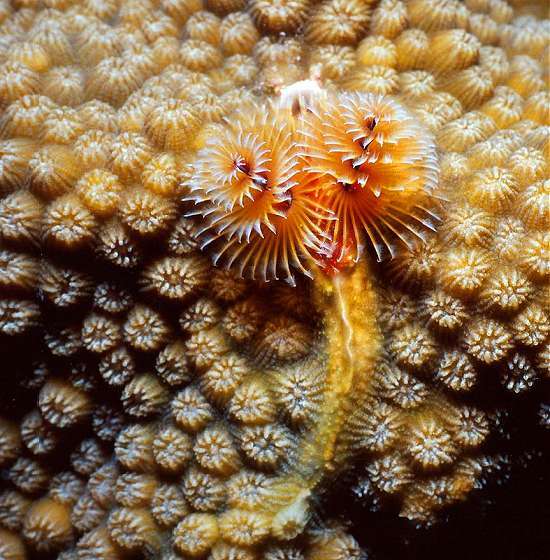 Click here to see another picture of a Christmas Tree Worm. Many fish such as Butterflyfish try to eat these worms. Click here to see pictures of several different kinds of Butterflyfishes. Learn more about the reefs of Grand Turk on the ReefNews Grand Turk webpages.